AMTECH™ offers Weir A Type, Bolted Bonnet, Two Way, Manually Wheel as well as pneumatic and electric Operated, Fully FEP/PFA Lined Diaphragm Valve with Position Indicator.MOC of valves in Sg iron /Ductile,Cast Carbon Steel,Stainless Steel Body.Sizes range from 2" to 8"
Our PTFE-TEFLON LINED Diaphragm valves has easy installation, easy operation and suitability of replacement. 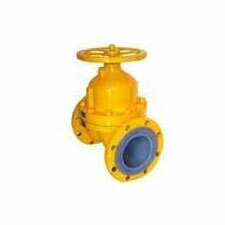 Flow through the valve is streamlined and it is easy to line the valve in order to increase chemical or abrasion resistance. Hand Wheel operation, pneumatically, hydraulically and electrically operated valves are available for automatic control of complex processes. Compressor Pin Type Ductile Iron/WCB/S.S. Diaphragm (pin Type) PTFE Backed With Neoprene Rubber,butyle OR as per customer requirements.